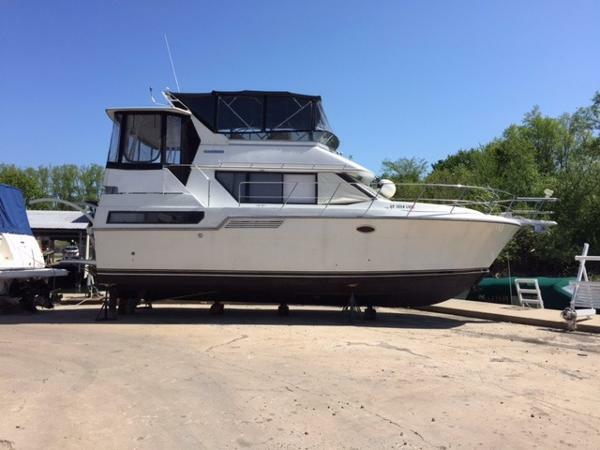 1989 Jefferson Aft Cabin Twin 210 HP Cummins Diesels3 Zone Reverse Cycle Heat/AC8kw Westerbeke GeneratorCustom Interior DecorBarrier CoatedFull ElectronicsJust Reduced!!! 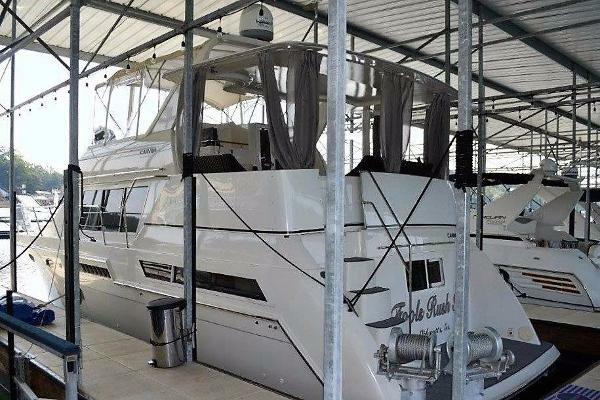 1984 Holiday Mansion 38 Aft Cabin Custom NEW LISTING - Twin V-drive Crusader inboards, generator, custom interior, small apartment living! flybridge, water heater, onboard battery charger, two air conditioners, custom galley layout In 2012 the owner installed new horns, new potable water pump, salon rebuld/refurb In 2011the owner rebedded upper deck railings In 2010 the owner replaced house and starter batteries, packing replaced on both prop shafts stuffing boxes. Must see to appreciate! 1997 Carver 355 Aft Cabin 1997 355 Aft Cabin Carver FRESH WATER Motor Yacht LOA 410 with 133 Beam . in immaculate condition. 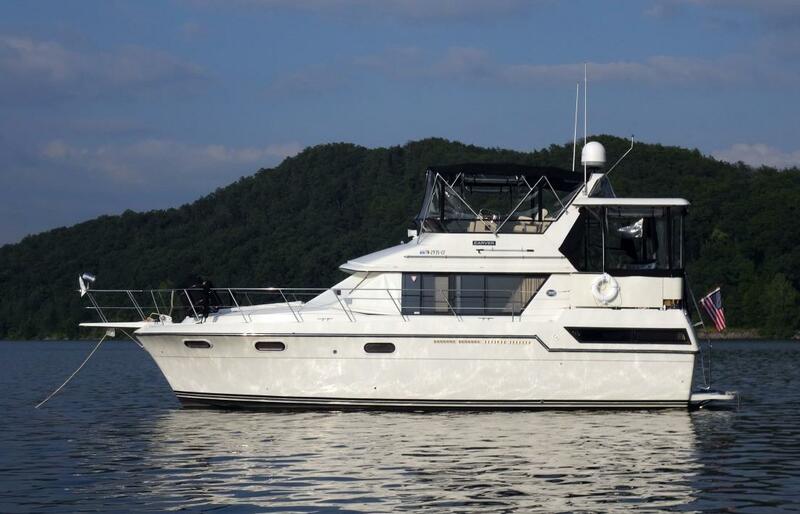 Great family motor yacht with only 290 hours on twin 7.4 454 XLI crusader engines with electronic fuel injection as upgrade. 8 KW oversized Kohler generator with only 112 hours always kept in fresh water ( Never ever been in salt water) always kept under covered slip since new. Meticulously kept Vessel was pulled out of water few months ago for complete inspection and removal and new three coat application of anti-fouling paint, new pin striping and new Magnesium anodes installed. Drive shaft packing and complete compound, buff and wax was completed in 11/2016. Gel coat on the vessel is flawless. Brand new exterior and interior carpeting, complete New interior upholstery new flat screen 40 inch Samsung smart TV, brand new comforters, bed covers, pillows, pullout sofa turns in to bed and sleeps 8 comfortably. Full size AC/DC Norcold refrigerator with Freezer 3 Burner Oven/ Range, powerful central vacuum a must for easy cleaning the interior as well as the exterior Bridge area. 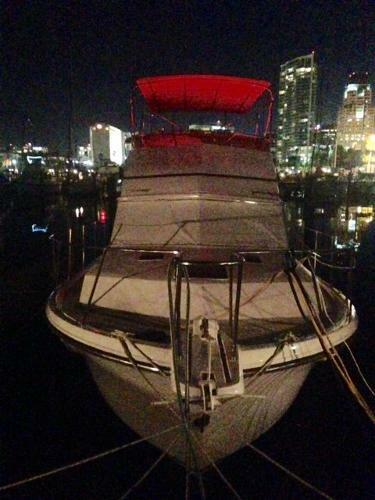 Bilge heater for winter months..New LED 2700 warm lighting through out the vessel with new Marine batteries. Brand new Custom designer Aluminum mini blinds, new Canvas Strataglass, Brand new exterior seating furniture, new Garmin GPSMAP 741xs touch screen GPS Sounder chart plotter, depth finder, fish finder. Raytheon Depth finder, VHF radio, Exterior wet bar with rapid icemaker as upgrade. Two Marine air HVAC units in excellent running condition as well as built in dehumidifier and hot water heater. All original manuals included. Three CO detector units, 3 new fire extinguishers as well as Halon fire extinguisher system in the engine compartment. with fire boy fume detection system . Vessel has engine synchronizer gage as well as Rudder angle indicator gage as upgrade. Remote spot light and oversize remote winless. Vessel accommodates two state rooms with two full heads with two showers and two separate holding tanks in total 72 Gallons and a 11 Gallon hot water heater. Both heads have Vacuflush system as upgrade on the Vessel. Easy entry to the vessel and walk around the deck, great open oversized living area with separate eating area and oversized galley. To many other upgrades to list full tune up, plugs, impellors, fuel filters, fuel/ water separators and fuel rail filters and belts, oil change on both engines as well as the generator. Boat is ready for the season. 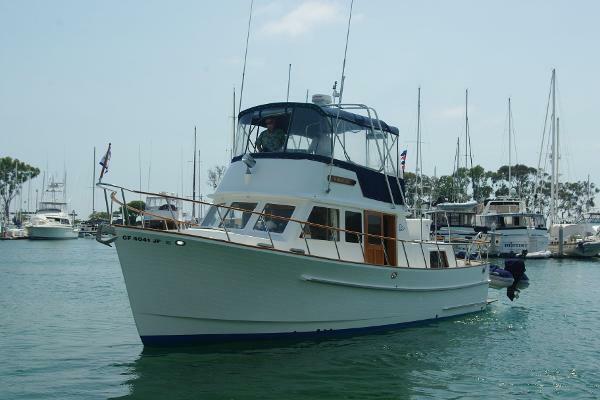 1985 Monk Trawler Aft Cabin This 36' Monk Trawler is the nicest vessel on the market today. Maintained to the highest standards and in immaculate condition. Construction is of solid fiberglass, highly flared bow and a very dry ride. Typical Taiwan all teak interior with custom craftsmanship. 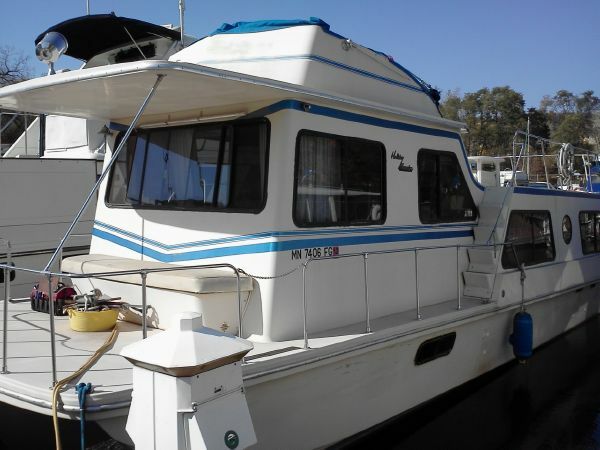 Galley up with plenty of storage for long coastal cruising, double stainless steel deep sinks, full size fridge and freezer and 4 burner stove. Seating for six around the custom teak table that also converts to a bed. Nice open and airy salon, large windows. 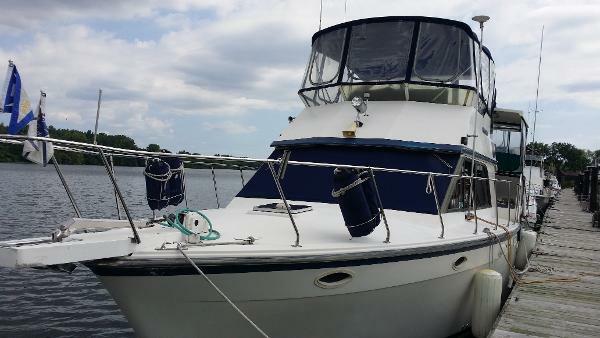 Plenty of storage for coastal cruising or long stays at the islands. Forward stateroom with v berth, 12 volt fresh water head system and shower plus vanity with plenty of storage. The aft stateroom has a queen centerline bed with storage lockers to Port and starboard sides. The aft head has a separate stall shower,12 volt fresh water head and vanity with storage lockers also. The bridge with full enclosure is all custom designed with teak railings, teak and holly sole with nine coats of high gloss varnish. The teak railings and doors have just been striped and varnished also. Forward and aft decks along with wide gunnels have also been finished with non skid and looks great. On deck, raised bulwarks and a high rail make moving around the house safe and secure. This vessel comes with twin Ford Lehman 225 H/P turbo charged engines. Complete set of upper and lower controls and electronic packages, along with a Simrad A/P 11 Auto Pilot. 2 fuel tanks with a total of 320 gallons of fuel makes this boat a great long range cruiser for harbor hopping the Pacific coast north or south. For more detailed information please take a look at the full specks. 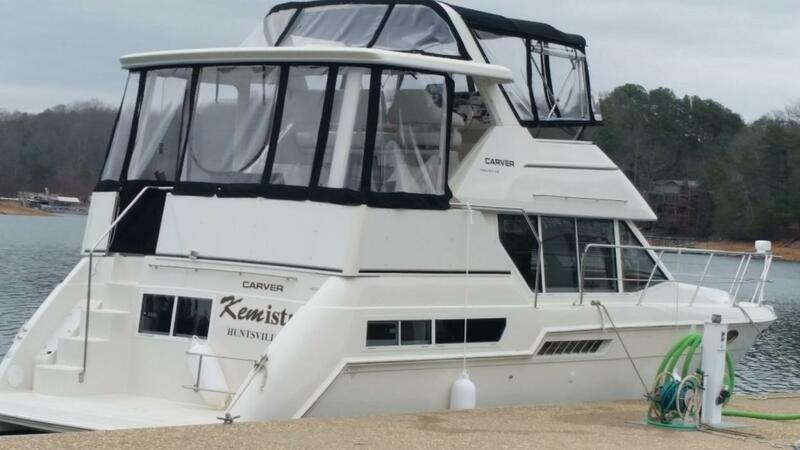 1993 Carver 370 Aft Cabin DRASTIC PRICE REDUCTION OF CLOSE TO $20K!!! SELLER WANTS THIS BOAT GONE!!! 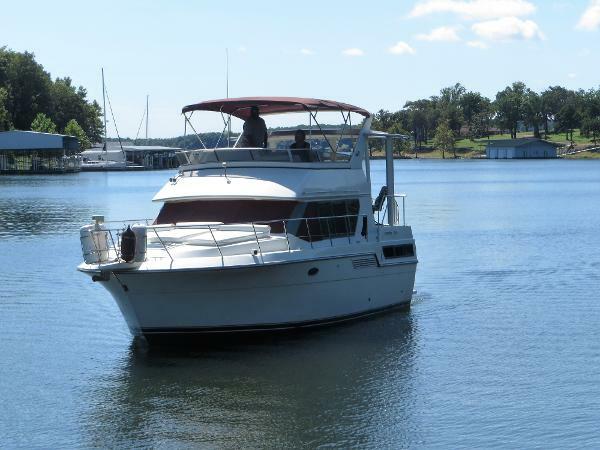 This fresh water only 1993 Carver 370 Aft Cabin vessel features 2 staterooms, each with own head, lower helm station, galley, dinette, an open salon, hard top covered aft deck, and a large fly bridge. It is powered by twin MerCruiser 454CID-350hp engines with approximately 475 hours (replaced at 1350 hull hours). 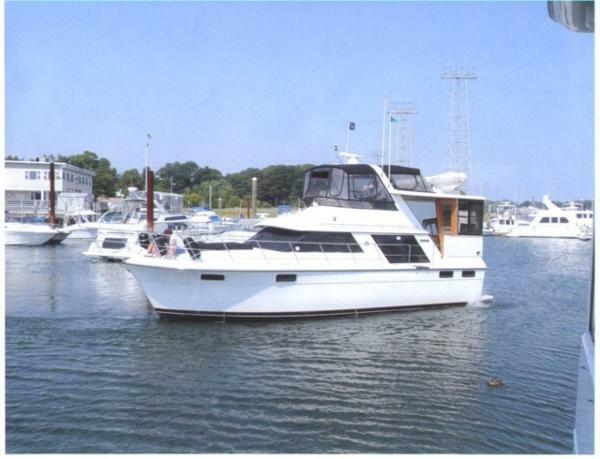 Original boat equipment: Kohler 7.0kW generator, Auto helm auto pilot, (3) zones of reverse cycle heat pumps, anchor windlass, Garmin 232C chart plotter, depth finder, Raytheon radar and Std Horizon VHF. This vessel sustained interior damage in 2005 and under went a major retro fit in 2006: with new soft goods- new head liners and carpet in salon and both staterooms, hull liner in salon and aft head, new dinette cushions, custom Bali window coverings in salon and aft state room, and new mattresses in both staterooms. Additional improvements include: Corian solid surface counters installed in the galley, all horizontal surfaces in the salon and the aft head. The galley has new refrigerator, dishwasher, two burner ceramic electric cook surface, a combination microwave/convection stove and under counter sink with designer faucet.A combination clothes washer/dryer is installed in fwd stateroom. The salon has a new Flexsteel ultra leather couch/pull out bed and lounge chair. Also a dry bar cabinet with glass storage.On the exterior, the rear deck canvas enclosure and carpeting are new.The boat is set up for cruising with pendant and/or joystick bow and stern electric thrusters, swim platform mounted dual electric dingy davits with remote radio control, and floscan fuel xducers with monitoring gauge.Call or stop in...this boat is a must see!